Power Paws can help! 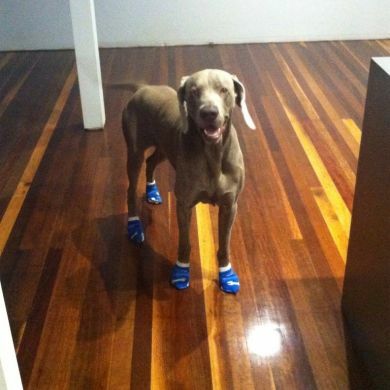 The non-slip base on these socks grips onto slippery surfaces to give your dog the traction she needs. 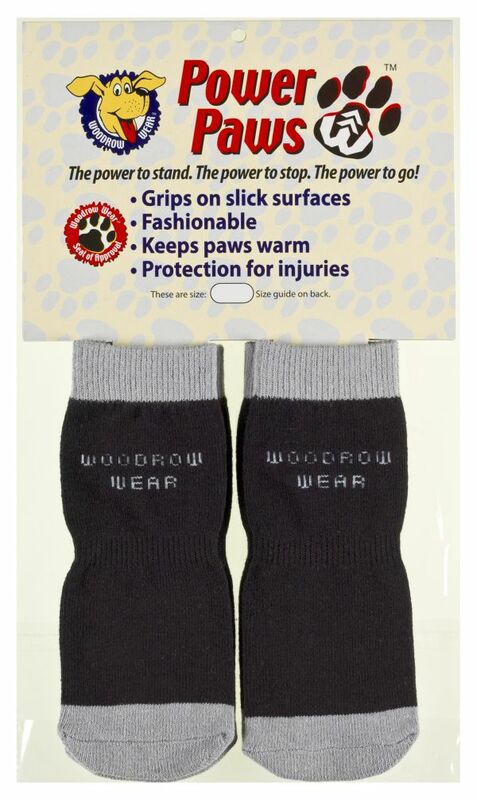 Power Paws are also helpful for protecting paw wounds. 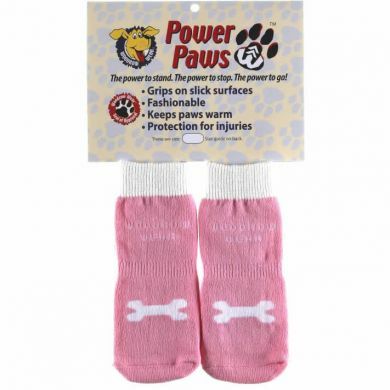 Pop a Power Paws sock over the injured paw to help protect the injury. They can also be worn on hot pavement as a barrier to extreme heat. Use them as a barrier against pollen, grass or other allergens. 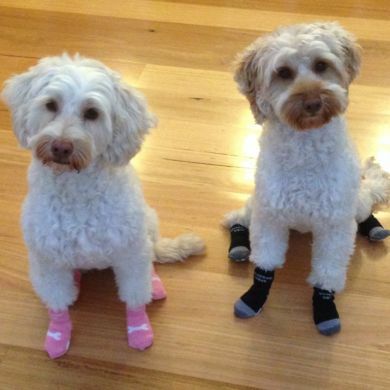 These super socks also keep your dog's paws warm & toasty. Does your dog have difficulties with slipping on wooden or laminate flooring? Designed predominantly for indoor use, Power Paws are very helpful for dogs with hip dysplasia and arthritis. 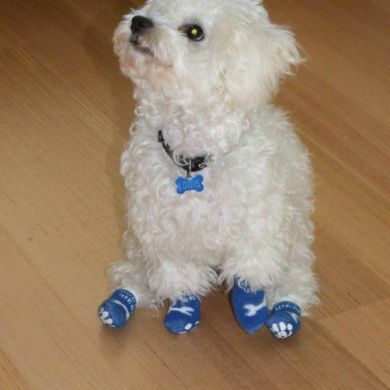 They can help your dog regain the traction needed to stand, walk and stop slipping. Older dogs will regain the confidence they need to be more active. 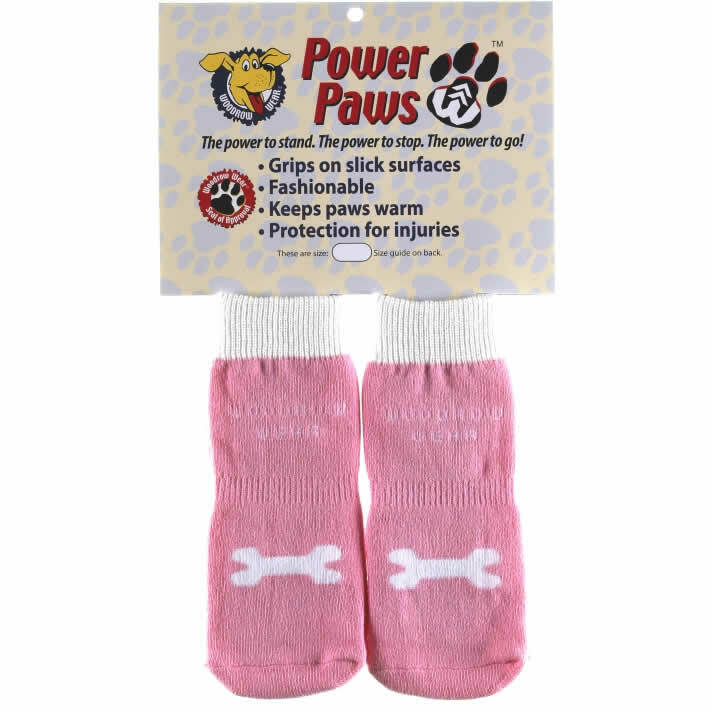 The 'Advanced' line of Power Paws Dog Socks comes with a reinforced toe section to help prevent your dog from pushing through the sock. 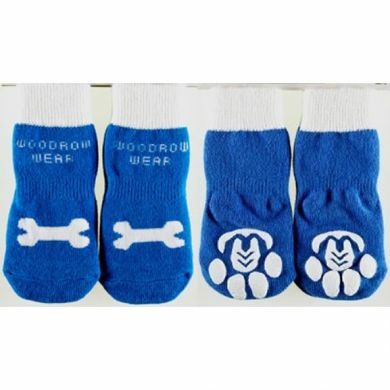 Power Paws Non-Slip Dog Socks are made for dogs with rounded, wide paws. 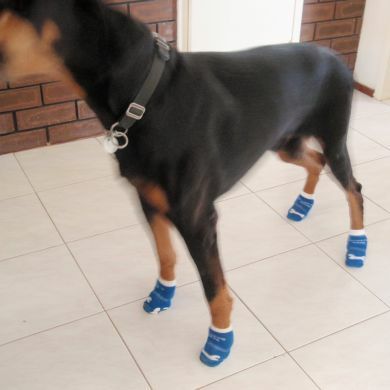 If you have a dog with long, narrow paws (such as a greyhound, whippet or poodle), have a look at the Power Paws Advanced Non-Slip Dog Socks for Greyhounds. Each Set Contains 4 Socks. Power Paws are for wide pawed dogs such as Terriers, Labradors, Boxers, GSPs, Rotties, Hounds, Great Danes and St. Bernards. 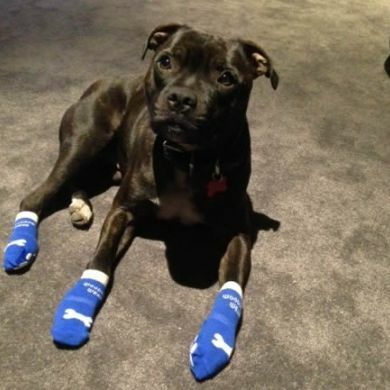 If you have a dog with long, narrow paws (such as a Greyhound, Whippet or Poodle), have a look at the Power Paws Non-Slip Dog Socks for Greyhounds. The size chart provides weight and breed suggestions. Breeds listed are a suggested Guide ONLY - individual fit may vary. 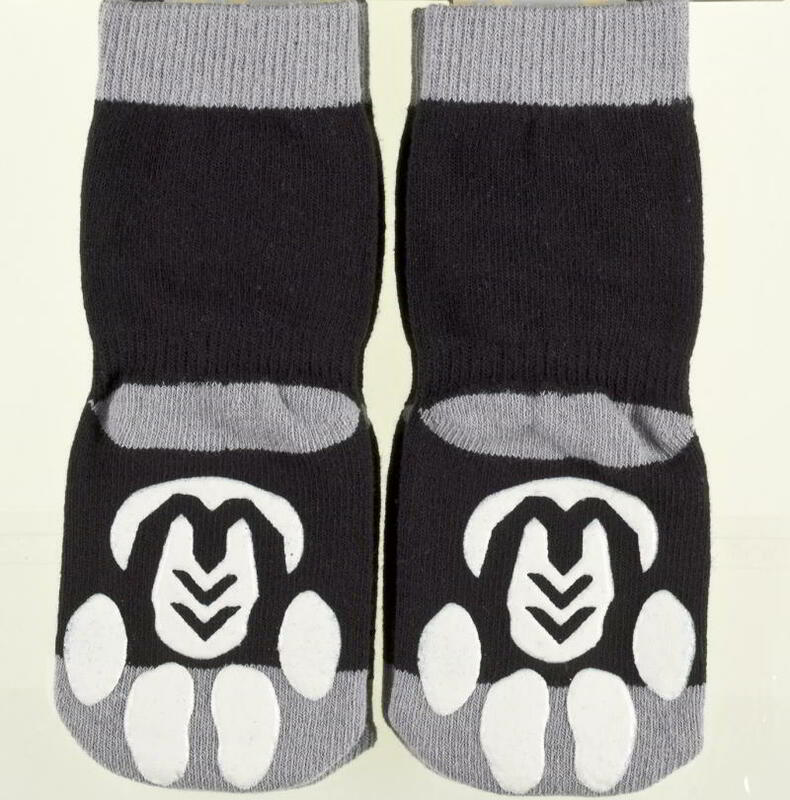 Here's a link to a PDF that you can print out to give you an idea on paw size as well. 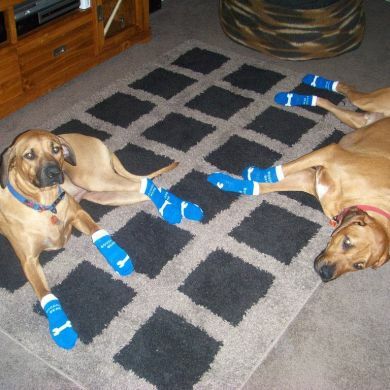 To extend the life of the socks it's best to trim your dog's nails before wearing. How Do I Know If The Fit Is Good? Power Paws look small, but they can really stretch a lot. You don’t want a loose fit or they’ll slide around the foot and not provide traction! If you have the right fit the socks will stay on when playing or engaging in any activity. A snug, stretched sock is the sign of a correct fit. The elastic should hold the sock in place. 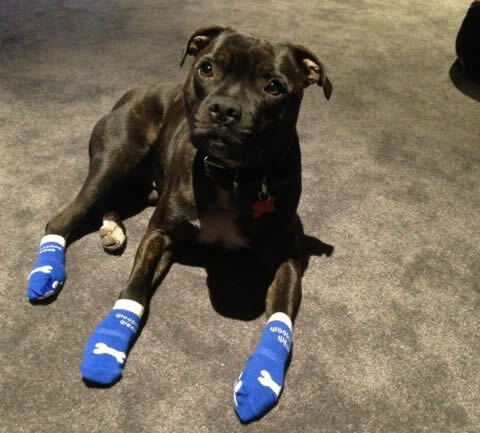 You should not be able to fit it on your dog's paw with more than 1 of your fingers inside as well. That indicates the sock is too large. If it flops, falls off or sags it's too big. The sock is close to fitting if it twists but doesn’t fall off immediately. If it rotates so the grip is on the side or top of try washing them in warm water and airing dry. See the washing instructions below as they can help you adjust the size. 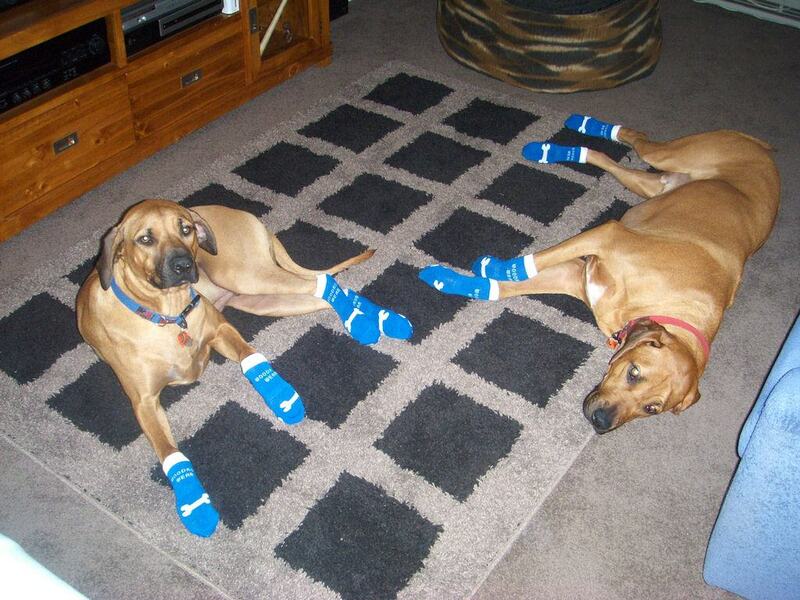 When you receive your new socks please be sure to give them a good solid go on your dog INSIDE before going outside. We want your dog to be comfy! We are more than happy to refund or exchange items as long as they have not been worn outside and are still in NEW condition. No questions asked! When your Power Paws get dirty you can just toss them in the washing machine. A permanent press or gentle cycle with cold water is advised to avoid shrinkage. 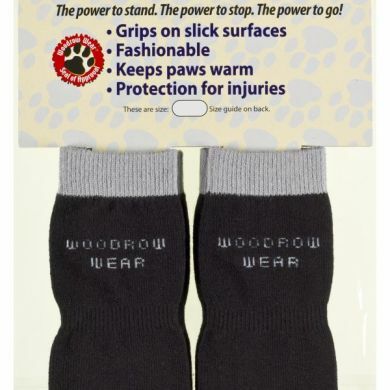 Dry on low heat or air dry, and your Power Paws will come out clean and good as new. Need to shrink your Power Paws because they twist? Just machine wash in warm water, then air dry. If the fit is perfect, you are done shrinking. If the fit is better, but still not 100%, you can wash them on warm and dry on warm. This approach may take longer but is designed to give you the very best fit. 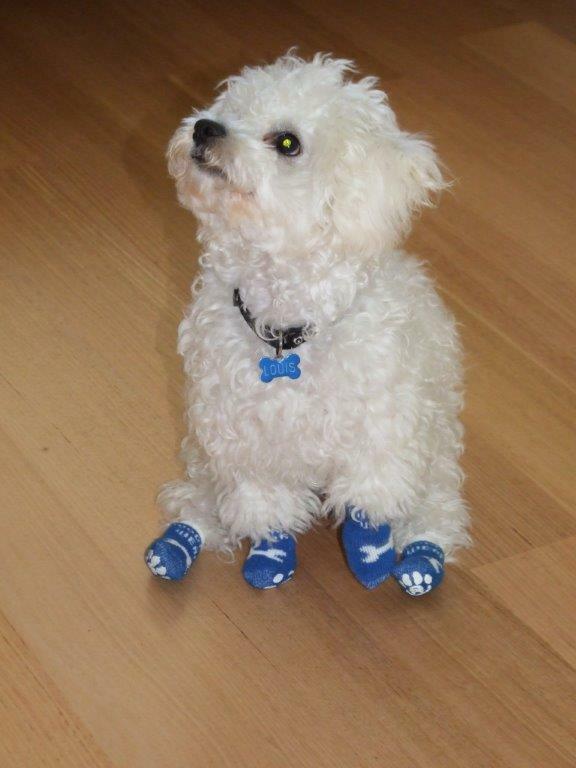 Read 87 customer reviews of Power Paws Advanced Non-Slip Dog Socks. The average customer rating is 4.4. The socks i bought were too large. Very impressed how quickly I got them returned, with no fuss. Have just ordered the smaller size. My German Shepherd is very comfortable with his boot and sock liner, so hopefully the indoor socks will be just as comfortable! I got the medium size and perhaps should have selected the small. They tended to fall off. 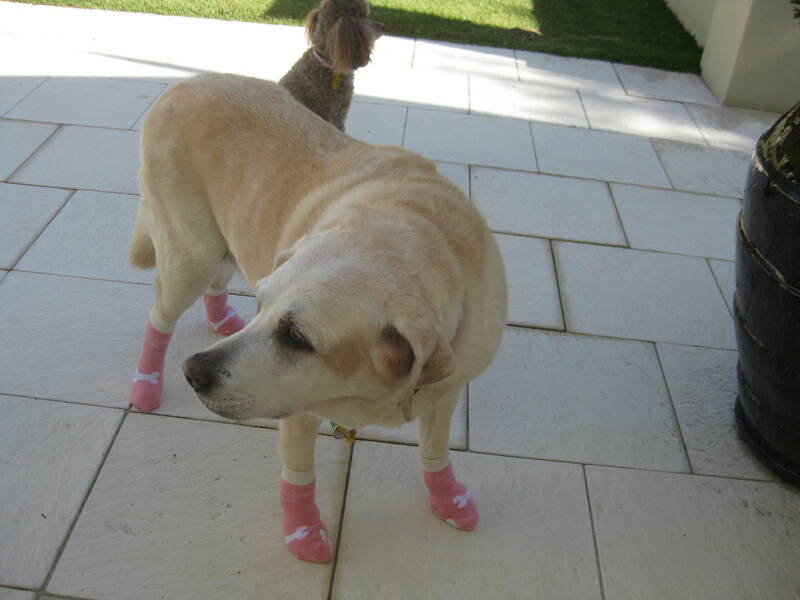 My dog didn't like having them on. Perhaps if I persevered it would have improved. I think buying carpet runners will be a better option. 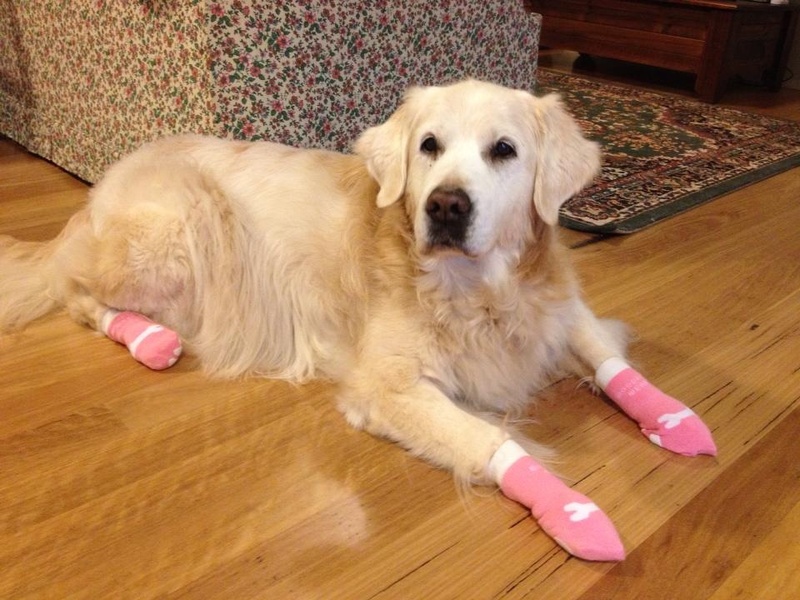 I recently purchased these dog socks as my vet recommended I have a look at your website as our 10 year old Golden Retriever was having trouble walking and getting up off our tiled floors as we have recently moved into a new home. They are really great and she is more than happy to have them on her feet with no trying to pull them off and is able to get up and walk much better. Thank you so much for the product for the prompt service. I have an 11 year old vizsla who’s been having a lot of trouble with our polished floors. 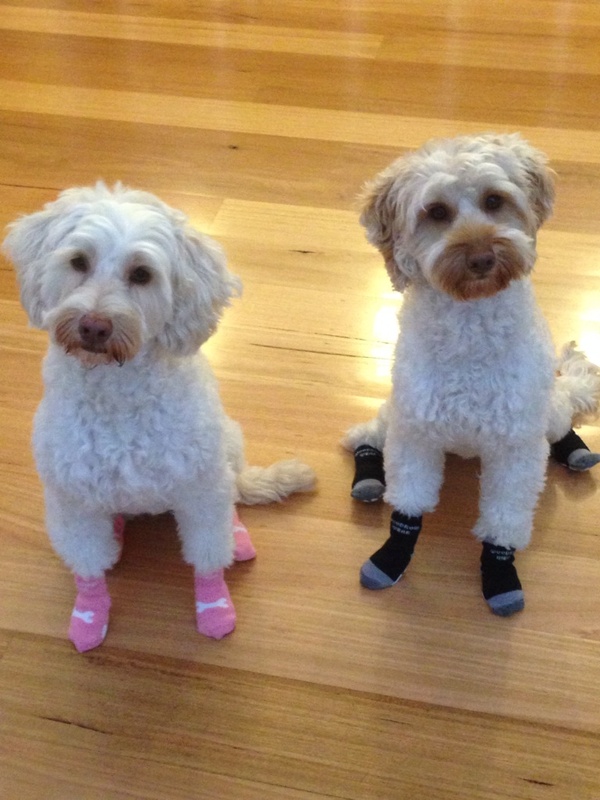 I have tried many styles of dog socks and have found Power Paws Advanced Non-Slip Dog Socks to be the best. They have the right sizing with a quick wash giving them a slightly tighter fit . Sid now waits for me to put his socks on when he comes back inside after a run and is a much happier dog. 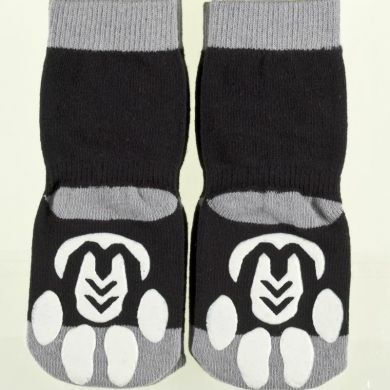 Purchased these sox for indoor wear, as one of my dogs has long nails and they sometimes scratch elderly people, as their skin is quite fragile. 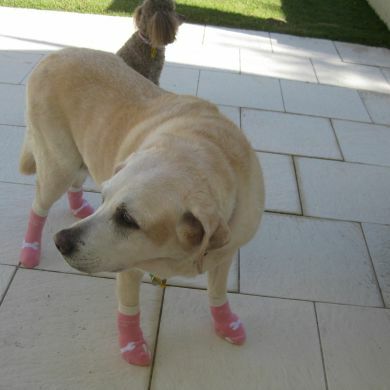 My dog had her front paws placed in these sox and she was quite happy to wear them. They are tight and do not fall off and have a slight non slip material on underside. 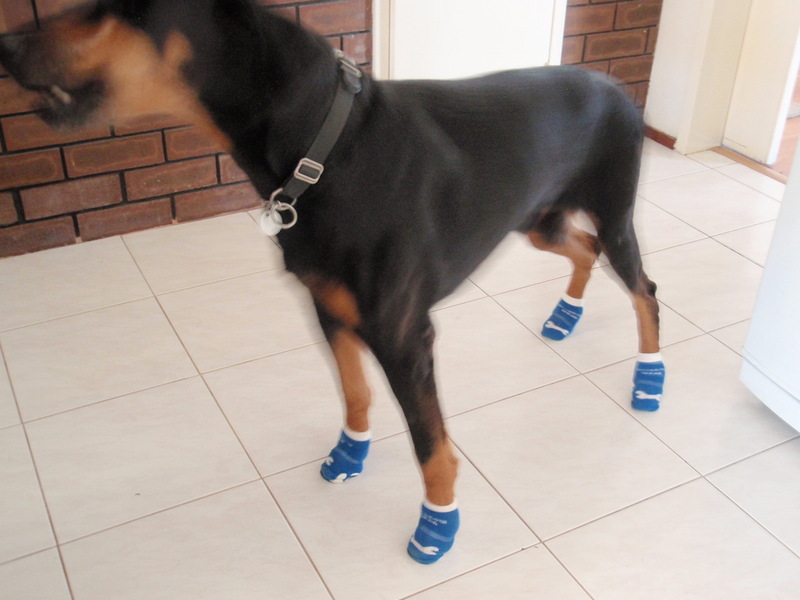 I purchased two pair of these for my dogs for indoor use as we have slippery tiles and both dogs were suffering from lack of traction. However I found they would not stay on so they are now used under their outdoor boots and in that purpose they are excellent. 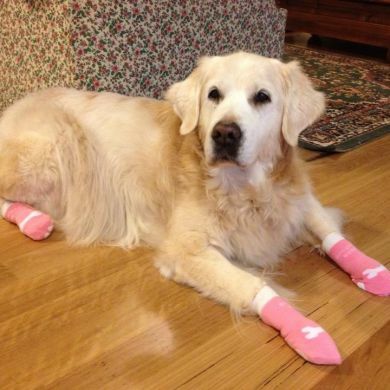 I recently purchased the non-slip Dog Socks. I was worried they would not stay on as I have a small very active dog but there was no problem at all and his gallery is getting so much better! !